Some foods promote inflammation and some reduce it. Chronic intestinal inflammation drives a variety of diseases such as inflammatory bowel disease (IBD), colon cancer, obesity, cardiovascular diseases, and type 2 diabetes, which plagues society today. Because plant-based food is effective against chronic diseases via modulation of gut microbiota and inflammation, there is a growing interest in anti-inflammatory staple food crops. Potato contains anti-inflammatory components such as resistant starch, fiber, and anthocyanins. Given the wide variation in potato germplasm for these compounds, there exists an opportunity to further develop potato as a potent anti-inflammatory staple crop. Algunos alimentos promueven inflamación y otros la reducen. La inflamación crónica intestinal conduce a una variedad de enfermedades tales como la enfermedad del intestino inflamado (IBD), cáncer de colon, obesidad, enfermedades cardiovasculares, y la diabetes tipo 2, que invaden a la sociedad hoy en día. Debido a que el alimento basado en plantas es efectivo contra enfermedades crónicas por vía de la modulación de la microbiota del intestino y de la inflamación, existe un creciente interés en cultivos de alimentos básicos antiinflamatorios. La papa contiene componentes antiinflamatorios tales como almidón resistente, fibra, y antocianinas. Considerando la amplia variación en el germoplasma de papa para estos compuestos, existe una oportunidad de desarrollar papa más adelante como un potente cultivo básico antiinflamatorio. The underlying etiology of seven out of the top ten leading causes of death (Table 1) in the USA is chronic inflammation (Heron 2017). Despite the recent advances in our understanding of the pathogenesis of inflammatory diseases, current therapeutic options (e.g., steroids, anti-inflammatory drugs for life and surgery) come with serious negative side effects. There is a growing recognition that food can either promote or prevent chronic inflammation via modulating gut bacterial diversity. A Western diet, marked by high saturated fat and high-sugar coupled with low fruit and vegetable consumption, drives chronic intestinal inflammation. Indeed, the prevalence of inflammation-promoted diseases is higher in migrant populations adapted to Western dietary patterns compared to their non-Westernized counterparts (Bjerregaard et al. 2007). In contrast, plant-based food is preventive against high saturated fat driven chronic inflammation (Wu and Schauss 2012; Charepalli et al. 2015; Sido et al. 2017) and promotes gut bacterial diversity (Simpson and Campbell 2015). A plethora of plant components including resistant starch, fiber, proteins and bioactive components such as phenolic acids, carotenoids, and anthocyanins suppress a variety of biological pathways that cause or advance chronic inflammation (Reddivari et al. 2007; Camire 2016). Thus, there is a critical need and opportunity to develop effective and evidence-based staple foods that retain anti-inflammatory activity, even after processing, to counter the global epidemic of chronic disease. Intestinal inflammatory conditions such as Crohn’s disease and ulcerative colitis, the two major forms of inflammatory bowel disease (IBD) are on the rise worldwide. Currently, ~1.8 million people suffer from IBD in the US alone. These intestinal inflammatory conditions are linked to leaky gut syndrome. Chronic intestinal inflammation is characterized by epithelial ulceration, immune cell infiltration in the lamina propria and crypt abscess. 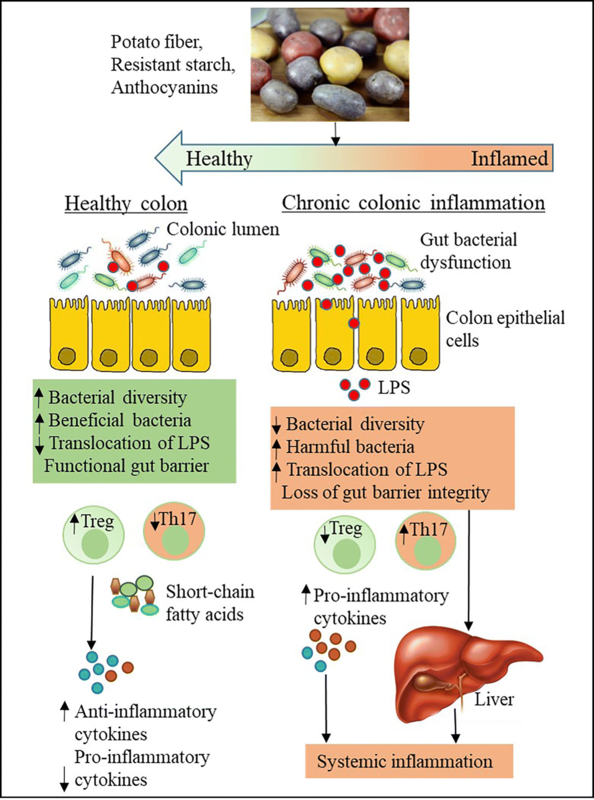 Emerging evidence suggests that intestinal health is central to overall health, and colonic inflammation is linked to systemic inflammation via visceral fat and liver inflammation (Li et al. 2008). Gut bacteria is one of the important environmental factors, which can either aggravate or alleviate chronic inflammation. A perturbed gut bacterial composition can lead to elevated bacterial endotoxin (lipopolysaccharide - LPS) and impaired barrier function. Elevated LPS induces activation of inflammatory signaling in the colon. Impaired barrier function can result in leakage of bacterial endotoxins from the lumen into mesenteric fat, the liver and systemic circulation leading to immune cell activation and pro-inflammatory cytokine production (Fig. 1) (Ooi et al. 2014). Foods that suppress markers of chronic inflammation in vivo are considered to possess anti-inflammatory activity. Potatoes can be used to counter the chronic diseases safely and affordably as recent evidence suggests that certain potato cultivars, even after processing, retain anti-inflammatory activity in vivo (Charepalli et al. 2015). Potato provides 5% to 15% of dietary calories for various populations around the world (Thompson et al. 2009) and is the leading vegetable crop in the US, with annual per capita consumption of about 115 lbs. (NPC 2018). The United Nations declared the year 2008 as ‘The International Year of the Potato’ to raise awareness of the potato (Solanum tuberosum L.) in addressing nutritional issues of global concern, including hunger, poverty, and threats to the environment because potato is an inexpensive source of energy and good quality protein. In addition to providing carbohydrates, proteins, essential vitamins, and minerals, potatoes are rich in a variety of anti-inflammatory components such as resistant starch, fiber, phenolic acids, anthocyanins and carotenoids (Camire 2016). The potato is considered as the third largest source of phenolic compounds in the human diet after oranges and apples. The popularity and high consumption make potatoes and potato products an attractive “delivery system” for anti-inflammatory compounds in humans. In this review, we will focus on the anti-inflammatory properties of potatoes particularly potato resistant starch, fiber, and anthocyanins in improving intestinal health. Potato dietary fiber comprised of approximately 2.5% tuber mass is made of cellulose, hemicellulose, and pectin, which are resistant to digestive enzymes. Raw potato starch (amylose and amylopectin) is also highly resistant to hydrolysis by amylases in vitro due to granule crystallinity and high phosphorylation. Variation in the content of both fiber and resistant starch (RS) due to cultivar is minimal compared to the significant alterations caused by the processing method (Visvanathan et al. 2016). Fiber and RS are metabolized by gut bacteria leading to elevated levels of short-chain fatty acids (SCFA) in the colon. The anti-inflammatory properties of potato fiber and RS are in part due to the elevated levels of SCFA and SCFA-producing bacteria (Paturi et al. 2012). A cross-sectional study involving 103 adult patients (50 with active inflammatory bowel disease and 53 in remission), showed that potato and legume consumption were inversely associated with disease relapse (p = 0.023). Patients in the highest quartile for legume and potato consumption had a 79% lower risk of active disease as opposed to meat consumption. The anti-inflammatory effects were attributed to the fiber and RS present in potatoes and legumes (Tasson et al. 2017). Moderately fermentable potato fiber supplementation at 14.5% reduced inflammation in a mouse model of colitis induced by dextran sulfate sodium (DSS). After exposure to DSS, potato fiber consuming mice showed lower infiltration of leukocytes, cells of the immune system, and transcription of inflammatory markers. The authors concluded that the attenuation of inflammation during DSS-induced colitis was potentially due to the SCFA that are produced by the gut bacterial fermentation of potato fiber (Panasevich et al. 2015). Long-term (14 wk) intake of potato RS improved the mucosal integrity and reduced the damage to colonocytes, subsequently reducing colonic-systemic immune reactivity in pigs. Potato RS-consuming pigs had two-fold higher butyrate levels in proximal colon digesta. The resistance of the mucosa to bacterial infection was higher in RS-consuming pigs compared to cornstarch. Potato RS reduced the numbers of intraepithelial T cells and blood leukocytes, neutrophils, and lymphocytes indicating a reduction in colonic-systemic inflammation (Nofrarías et al. 2007). Potato fiber and RS have shown distinctive effects on the colonic environment in a rat model using a dietary combination of red meat and potato fiber or RS. Cecum and colonic SCFAs (acetic, butyric, and propionic acids) were greater in the potato fiber diet rats than in potato RS diet rats. However, both potato fiber and RS diets improved colon health (Paturi et al. 2012). A strong association between potato consumption and SCFA production in the colon was observed in a study conducted in Spain involving older adults (Cuervo et al. 2013). Pigmented potatoes are a rich source of anthocyanins, which play an important role in chronic disease prevention. Though both red- and purple-fleshed potatoes contain anthocyanins, the content and composition of anthocyanins differ. Moreover, bioactivity is also dependent on the anthocyanin composition. Anthocyanin content of purple- and red-fleshed potatoes ranged from 5.5 to 51 mg/100 gfw and 6.9 to 35 mg/100gfw, respectively. Red- and purple-fleshed cultivars had ~ 10–20 times greater antioxidant activity than white-fleshed potatoes, which could be attributed mainly to the presence of anthocyanins and greater amounts of phenolic acids (Madiwale et al. 2012). The predominant anthocyanidins in red-fleshed potato are pelargonidin and peonidin and in purple-fleshed potato are malvidin and petunidin. Though anthocyanins are low in the systemic circulation, they may still influence colonic-systemic inflammation due to their high concentration and direct contact with the gut. Purple potato anthocyanidin glycosides were able to transport intact across intestinal cell membrane in vitro indicating potential bioaccessibility of anthocyanins (Zhang et al. 2017). Purple-fleshed potato anthocyanins have been shown to reduce high-fat diet and dextran sodium sulfate (DSS)-induced colonic-systemic inflammation in pig and mice models through their effect on pro- and anti-inflammatory cytokines and gut barrier function (Fig. 1). Purple-fleshed potato supplementation (10% w/w; approximately equal to 400 g of daily intake of potatoes) for 15 wk. suppressed HCD-induced colonic inflammation in a human-relevant pig model. Potato diets had no effect on food intake, weight gain and back-fat thickness of pigs (Sido et al. 2017). Mice supplemented with baked purple- and red-fleshed potatoes (25% w/w) were exposed to dextran sulfate sodium (DSS) in drinking water for seven days. Mice receiving DSS alone exhibited robust colitis as characterized by an enlarged spleen, liver hypertrophy, elevated oxidative stress and gut permeability, and reduced colon length. Red and purple potato supplementation suppressed (p ≤ 0.05) DSS-induced reduction in colon length and increase in liver weight. Both red- and purple-fleshed potatoes improved gut barrier function as measured by the leakage of FITC dextran into the serum. However, purple potato supplementation was more effective in ameliorating the DSS-induced increase in intestinal permeability, spleen weight, and systemic oxidative stress as well as the reduction in colon length (p ≤ 0.05) in mice compared to red-potato (Reddivari et al. 2017). Purple potato extract also inhibited D-galactosamine (GalN)-induced liver injury and inflammation in rats (Han et al. 2006). Purple potato anthocyanins improved the intestinal epithelial cell differentiation, and barrier function (Sun et al. 2017) and anthocyanidin derivatives inhibited the secretion of pro-inflammatory cytokines (Zhang et al. 2017). These results indicate the anti-inflammatory effects of purple potato against both chemical and genetic models of mice colitis. Free-living healthy men consuming 150 g of purple potatoes daily for six weeks had lower levels of C-reactive protein (CRP) and systemic inflammation compared to white-fleshed potato consuming men (Kaspar et al. 2011). Gut bacteria play a major role in the etiology of chronic inflammatory diseases. A higher abundance of Proteobacteria and Actinobacteria phyla members and lower abundance of the Bacteroidetes phylum in the intestines are associated with chronic inflammation compared to healthy controls. In the mice model of colitis, increased numbers of Enterobacteriaceae, Bacteroidaceae, and Clostridium spp. were observed compared to control mice. Anthocyanins promoted beneficial bacteria while reducing pathogenic gut bacteria. For example, anthocyanins enhanced the growth of Bifidobacterium spp. and Lactobacillus spp. resulting in reduced gut luminal LPS. Anthocyanin-rich purple potato extracts showed a higher inhibition of E. coli compared to the antibiotic drug chloramphenicol in vitro. Higher levels of E. coli in the gut are associated with colonic inflammation (Camire 2016). Moreover, gut bacteria might potentially contribute to the metabolism of potato anthocyanins into anthocyanidins and phenolic acids (Hidalgo et al. 2012). A majority of these studies are association studies or in vitro studies. Understanding the two-way interaction between gut bacteria and potato anthocyanins and the mechanisms of action will help in improving the bioavailability and anti-inflammatory efficacy of anthocyanins. Along with beneficial anti-inflammatory components, potatoes also contain naturally occurring toxicants such as glycoalkaloids. Both anti- and pro-inflammatory roles of glycoalkaloids, depending on the dosage, were reported in the literature using both in vitro and in vivo models (Iablokov et al. 2010; Kenny et al. 2013). However, given the current regulations on glycoalkaloid content in cultivated varieties, glycoalkaloids are not likely to be pursued as sources of anti-inflammatory compounds. In conclusion, the growing burden of chronic diseases in society has increased public awareness of the health and food connection, and the benefits of plant foods. At the same time, the notion that potatoes are fattening in part played a role in the reduction of potato consumption. Thus, there is a critical need to increase the awareness of the health benefits of potatoes, as well as to further develop cultivars that are rich in a variety of anti-inflammatory compounds and that can retain their beneficial properties through the farm to fork continuum. 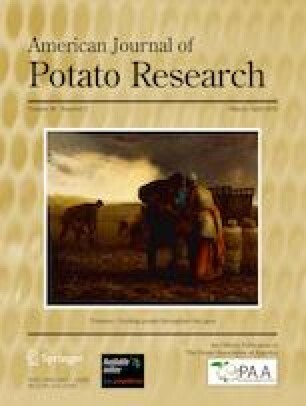 Given that gut bacteria play a critical role in the metabolism of potato bioactive compounds, systematic preclinical and clinical studies are needed to unravel complex interactions among potato bioactives, gut bacteria, and host to unearth the anti-inflammatory potential of the humble potato. We acknowledge Jairam K. P. Vanamala, Ph.D. for reviewing the article. Research is supported by Agriculture and Food Research Initiative competitive grant 2016-67017-24512 from the USDA National Institute of Food and Agriculture. Sun, Xiaofei, Min Du, Duroy A Navarre, and Mei-Jun Zhu. 2017. Purple potato extract promotes intestinal epithelial differentiation and barrier function by activating AMP-activated protein kinase. Molecular nutrition & food research. Germany. https://doi.org/10.1002/mnfr.201700536. Zhang, Hua, Yousef I. Hassan, Justin Renaud, Ronghua Liu, Cheng Yang, Yong Sun, and Rong Tsao. 2017. Bioaccessibility, bioavailability, and anti-inflammatory effects of anthocyanins from purple root vegetables using mono- and co-culture cell models. Molecular Nutrition and Food Research 61. https://doi.org/10.1002/mnfr.201600928.